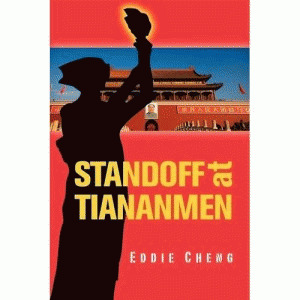 Due to the impending 20th anniversary of the Tiananmen Square massacre in Beijing, China, it is very timely that author Eddie Cheng has published the new book, Standoff At Tiananmen. While every history of the Chinese democracy movement is a partial history, this book has more detail about these matters than ever before in English. Tiananmen Square had world press attention, so that the largest features of the story became well known. Cheng's book becomes a narrative of the students' side of the story, and of the politics and decision making on their side. To account for the other side  the power struggle and decision making inside the government  is left to be the scope of other books, such as The Tiananmen Papers. That choice to limit the book's scope is fine with me  as a Generation Xer, on the side of the pro-democracy and anti-communist people, I believe that freedom is the right side of history, and I am most interested to have "our side" get its story straight.